This Giving Tuesday, Nov. 27, consider donating to the Ohio Farm Bureau Foundation. 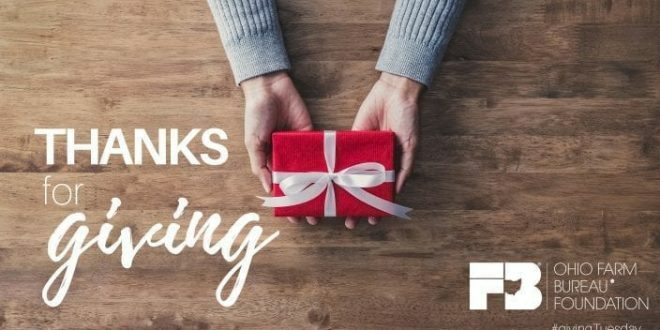 Every gift helps the Foundation do something that might not otherwise be possible, from supporting student scholarships, to funding innovation in communities, to driving economic growth. Training the next generation of agriculture producers, scientists, and business and community leaders is a key priority facing our state. The campaign for the OFB Foundation will expand our endowment to provide increased support for scholarships and professional development opportunities allowing individuals to advance their knowledge, share ideas, and improve people’s lives. Capturing opportunities that build prosperity, create jobs, and enhance the quality of life for Ohioans by funding projects that spur economic growth in local communities. Funding sensible solutions that contribute to a healthier, cleaner, and more sustainable Ohio by focusing on increased care for land and water.